After digging two shovels-full of dirt on what will be the Foxconn campus in the Village of Mount Pleasant, Trump shook Foxconn CEO Terry Gou’s hand, and addressed the crowd. "One of the great men of the world, one of the great business leaders of the world, it’s really an honor to have you … you’re going to love Wisconsin, you’re going to love the country," Trump said. House Speaker Paul Ryan, R-Janesville, and the first Wisconsin Foxconn employee Christopher Murdock were the other two men to join Trump, Walker and Gou in the ceremonial first digs. Miles away in downtown Mount Pleasant several hundred protesters, including Democrats hoping to unseat Walker this fall, gathered to disavow the project. Critics question the state's commitment to provide up to $4.5 billion in state and local tax incentives to help Foxconn, the most ever by a state to a foreign company. Opponents also worry about the environmental effects of the 20-million-square-foot campus, which will tap Lake Michigan for water. The plant is about 30 miles south of Milwaukee. The protest took on a festive atmosphere at a village park with speeches taking place under a pavilion interspersed by performances from a couple of politically oriented musical spoof groups from Madison, the "Forward! Marching Band" and "Raging Grannies." Patrick Schelble, a retired registered nurse from Milwaukee, said the state’s incentives package prompted him to join the protest. "I’m not sure why we’re doing it," SchelbIe said. "I know it is in search of jobs, and I do believe in that also, but I just see that this is something that is almost unheard of." One of the speakers, Laurie Longtine of the Waukesha County Environmental Action League, told the audience that Foxconn critics, no matter if they’re concerned over environmental aspects or the incentives package, are united. "We are fighting the same thing. We are fighting a government that is supposedly representing us but instead is taking our taxpayer dollars and using it to subsidize a foreign, muti-national company on our soil," Longtine said. "And in the process we’re going to be ruining our air, our soil, our water." Republican Assembly Speaker Robin Vos, a supporter of the Foxconn project and one of about 50 guests at the groundbreaking, asserted most of the protestors weren't from the area. "Most of this crisis is manufactured by the left and Democrats who don't want Wisconsin to succeed," he said. The Taiwanese company has pledged to invest up to $10 billion and employ 13,000 people. In exchange, it would receive roughly $4 billion in taxpayer incentives. Ryan and Walker say Foxconn's LCD screen manufacturing campus will transform the state's economy and make it a magnet for millennials. "This will make us a brain gain state, not a brain drain state," Walker said, predicting it will transform the state like Microsoft did for Washington state. Both Trump and Walker have touted the Foxconn project as a win for their respective administrations — the president as evidence of a manufacturing revival fueled by his "America First" policy, and the Wisconsin governor as validation of his conservative, pro-business agenda. 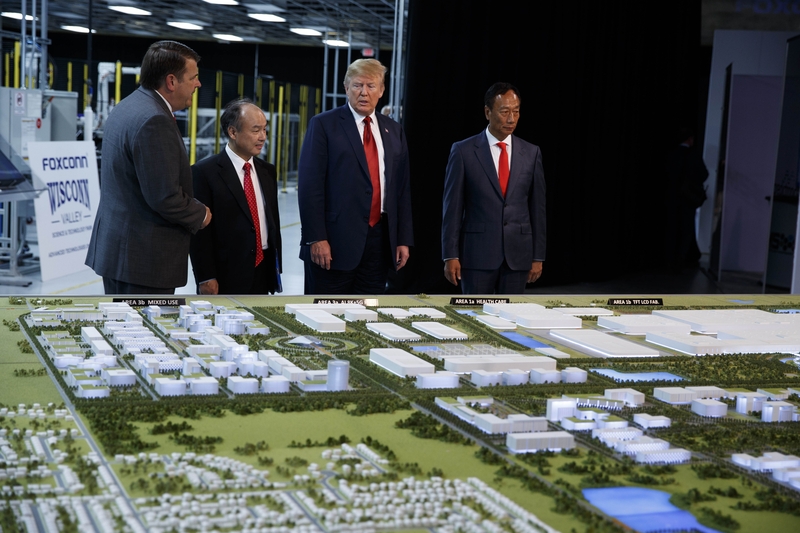 Following the groundbreaking ceremony, Trump — standing in front of a screen with "USA Open For Business" on it in Foxconn's nearby Opus building — praised both Foxconn and Walker for making the tech campus a reality. 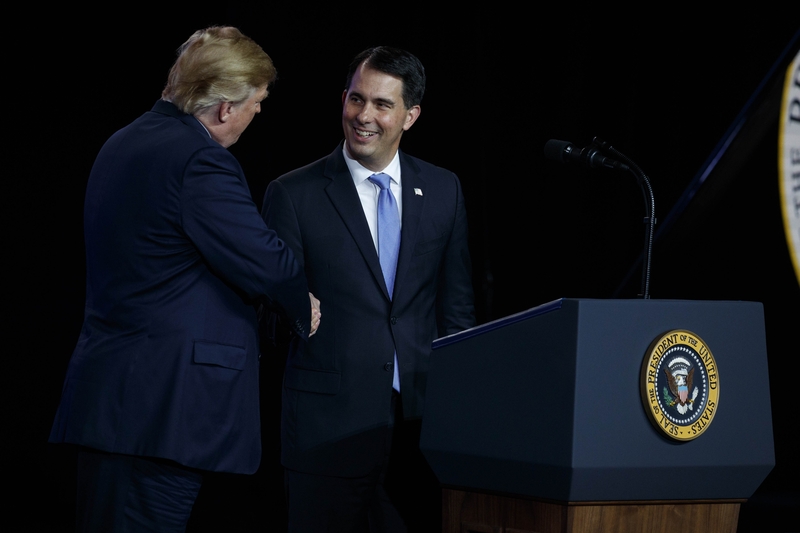 Before inviting Walker on stage, Trump said Walker is an "unbelievably talented governor," and is one of the few governor's who could make this project happen. Walker returned the compliments, telling the president, "Foxconn would not be in America if not for you." "This is as great as it is anywhere in the world," Trump said, saying materials from the U.S. will be used during construction, and later in his speech even going so far as to say the facility could be the eighth wonder of the world. "America is open for business more than it has ever been," Trump said. Ahead of the groundbreaking, which lasted less than a minute, Trump headlined a fundraiser Thursday morning in downtown Milwaukee. There, about a dozen protesters linked arms and momentarily blocked traffic in an intersection near the Milwaukee hotel hosting Trump, while a crowd of 100 or more chanted from the sidewalks. Jessica Quindel was at the protest near the fundraiser and said she wants the president to know separating parents and children at the border is wrong. She brought her 6-year-old daughter along to the protest. "Because she believes that we should keep families together as well, and I want her to see that when you don’t agree with something, there are peaceful ways to protest and fight back," Quindel said. Police and city garbage trucks kept the streets immediately surrounding the hotel clear of traffic and protesters. About 250 donors were expected at the morning fundraiser. The president's morning event was just a few miles from the headquarters of Harley-Davidson, which Trump has fiercely criticized in recent days over the company's decision to move some of its motorcycle manufacturing overseas to avoid retaliatory European Union tariffs. In his speech at the Opus building, Trump brought up tariffs and Harley. "Don’t get cute with us, don’t get cute," Trump said. "... Build them in the USA, you’re customers won’t be happy if you don’t." Editor's note: This story was last updated at 3:52 p.m. Thursday, June 28, 2018. Kyla Calvert Mason, Ximena Conde and Chuck Quirmbach contributed reporting.